Fitnesolution has been a pioneer in the fitness industry since 1996. We have held certification courses for various programs. The Course is a profound, personal experience, integrating the student's daily life into the yoga training. By the end of the intensive four-week course the student will possess a firm foundation for teaching others, in addition to strengthening his or her own yoga practice with self-discipline and awareness of the nature of body, mind and spirit. Upon graduation from the course, students receive a certificate of qualification. This course helps you to create a god and healthy life, embark on yogic journey of growth and self discovery and experience calm, peace and contentment. It provides you with foundation of yoga practice and its philosophy and enables you to teach safely the group and private yoga lessons. Since the introduction of course in 1996, we have managed to educate yoga practitioners and teachers, who have sound knowledge of yoga system and are able to convey it to their students with passion and wisdom. 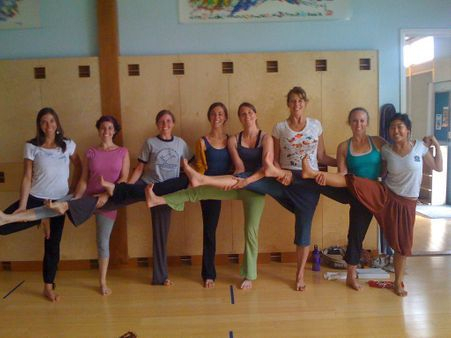 Our yoga teachers are now profoundly teaching in different parts of the world. They have had wonderful learning experience. This Course covers technical training, teaching methodology, anatomy and physiology, yoga philosophy, lifestyle, ethics and dedicated hours of practise.